James Moar on a show about a scientific genius, his plucky grandson, and their horrible, horrible adventures (now on your British space telly). It’s been suggested lately that the US has entered a period of peak TV. The number of scripted shows per season has been rising sharply in the past few years, thanks largely to streaming and basic cable (and maybe due to companies manoeuvring for a place in whatever happens to television next). The sheer quantity can feel like several parallel universes’ worth of TV at once, and it’s possible for very good shows to be lost in the shuffle. Which provides an obviously-contrived segue into talking about Rick and Morty, both one of the lesser-known gems of current American TV and a show that’s featured parallel-universe TV. Created by voice actor Justin Roiland (previously best known as Adventure Time‘s Lemongrab) and on-again off-again Community showrunner Dan Harmon, it’s a dark sci-fi comedy very loosely inspired by the relationship between Back to the Future‘s Doc Brown and Marty McFly. It airs on Adult Swim in the US, and has recently begun airing on Fox UK. A generous selection of episodes are also available to sample on Adult Swim’s website. 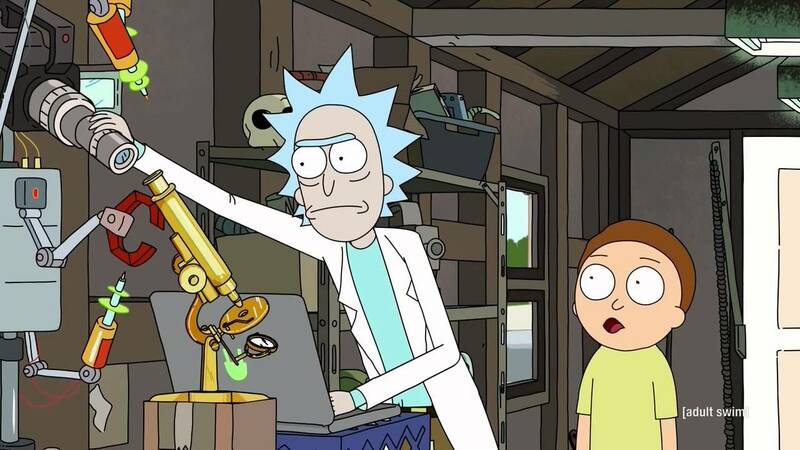 Rick (the Doc Brown character, voiced by Roiland) is a scientific genius who has invented gadgets allowing him to travel the length and breadth of this universe and several others. He’s also a jaded, narcissistic, alcoholic misanthrope who’s crashing at his daughter’s family home in the suburbs. His grandson, Morty (i.e. Marty, also voiced by Roiland), is a neurotic and not-so-bright teenager who Rick persistently drags into his adventures. While Rick dives into these adventures as if they were full of wonder, instead they generally reveal the universe to be a place full of horrors that do psychological harm to Morty and anyone else that gets drawn in. They result in things like being attacked by demon-possessed doppelgangers of your family, say, or meeting a race of smiling aliens who each want only to complete the one task they were created for so they can die. Or finding out a car battery is powered by enslaving the inhabitants of a microscopic universe. (Okay, that last one was entirely Rick’s fault). The keynote episode so far might be Rick Potion #9. Morty gets Rick to give him an invention which functions as a love potion to use on the girl he has a crush on, but it mutates and spreads to the entire world’s population. It’d be enough to make the story about the moral wrongness inherent in the idea of a love potion (which does get mentioned), but it soon jumps beyond that to the increasingly horrific side effects of Rick’s attempts to fix the problem, leading up to about the grimmest version of returning to the status quo to ever air on TV. The show started life as Roiland’s web animation The Real Animated Adventures of Doc and Mharti, which was somewhere between an obscene parody of Back to the Future and an attempt to get a cease and desist letter. Harmon came on board to develop it as a TV show. Harmon’s obsessions with story structure and sci-fi concepts, which enriched Community but were awkwardly bolted on to its basic concept, have found their natural home here. Roiland, on past form, seems to be more the source of the show’s odder tendencies and unrestrained style. In voicing Morty and Rick, Roiland uses a loose, semi-improvisational style quite unlike the hit-your-mark line delivery in most animation. It’s something which, which, the new viewer may have to, y’know, acquire a taste for, Morty, it’s quite an unusual style, but it definitely has its own unique charms. The animation has some of the stark design tendencies common in US adult animation, but the alien creatures and environments appearing in most episodes are inventively detailed and often lushly monstrous. While the rest of Rick and Morty’s family were created for the TV show rather than being part of the original concept, they’ve all become important characters in it. Morty’s older sister Summer (Spencer Grammer), introduced as a typical teenage girl and treated early on mostly as an annoyance, develops through the first season into a major participant in stories, with more backbone than Morty but less at home in Rick’s world. Summer and Morty’s parents Jerry (Chris Parnell) and Beth (Sarah Chalke) are your sitcom standard-issue doofus husband and smarter, more attractive wife. But the show knows full well they’re a badly-matched pair, and plays out the consequences in painful detail. Beth remains the least well-developed of the main cast, but the second season is beginning to establish her as sharing most of Rick’s flaws in more everyday forms. Jerry also comes to stand for the ordinariness that Rick holds in utter contempt. As dark as the show’s humour can be, it does have its redemptive side. Even if it might be only to make the effects of horrifying events on the characters really tell, it makes them more sympathetic than many other comedies of cruelty. In fact, it’s less flippant about its characters’ suffering than many a comedy which advertises itself as uplifting. And there are plenty of lighter jokes in the show too, despite the impression I may have given. That’s one US show airing in 2015 written about, so assuming nothing new’s premiered lately there’s just 266 others to consider. Finally, in case this piece hasn’t drummed the name of the show into your head enough, you could try watching this.